The current space rover strategy is to send one massive vehicle to an extreme environment, supported by a legion of staff back on Earth. If anything happens to the single rover, the mission is abruptly disrupted. Colorado-based startup Lunar Outpost proposes a different idea: send a well-equipped swarm of small, collaborative rovers instead. Founded in early 2017, the technology company (not to be confused with NASA’s lunar outpost) unveiled their Lunar Resource Prospector in a video released Monday. The featherlight rover could kickstart the lunar resource industry, providing detailed maps and data for future missions to our favorite dusty satellite and for the ultimate goal of a permanent lunar community. “We want to see as many people living and working on the moon as possible in our lifetimes,” AJ Gemer, chief technology officer of Lunar Outpost, tells Inverse. To achieve the ambitious dream of a lunar village, scientists first need a closer look at what awaits us — a task the Lunar Resource Prospector is equipped to do. Previous research has confirmed the presence of resources like water ice, helium-3 (notable for use in nuclear fusion) and rare earth metals, which are essential in technologies we rely on, from smartphones to MRI machines. This makes mining these resources — called “in-situ resource utilization,” or ISRU — a lucrative prospect. 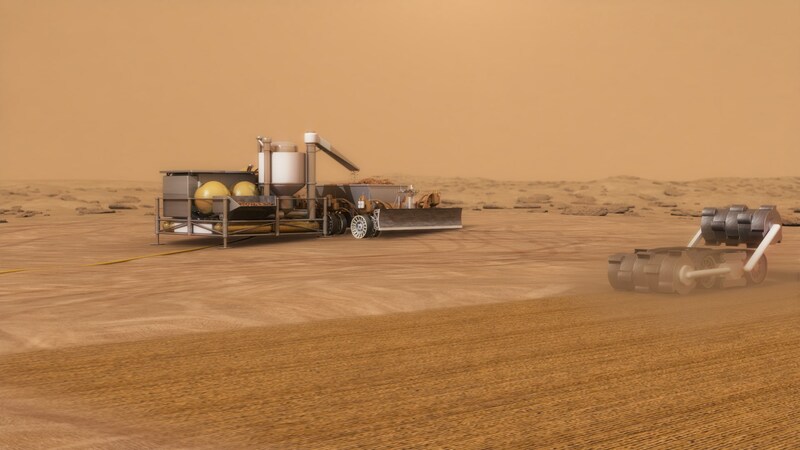 NASA's vision of harvesting water from Martian soil. ISRU could take place on the moon, Mars, asteroids, etc. Much of ISRU knowledge comes from a combination of orbiters and impactors, making the space community experts at giving the moon a drive-by or simply crashing into it headfirst. But the data from these missions can be limited. For example, the Moon Mineralogy Mapper aboard Chandrayaan-1 confirmed the existence of water ice molecules at the moon’s poles in 2009, but confirming its depth and quantity requires more data. It’s like looking at an aerial view of a swimming pool and guessing how much water is inside. The Lunar Outpost Prospector is designed to fill in those knowledge gaps. Equipped with a mass spectrometer to identify materials, and an onboard sub-surface sampling drill to dig in immediately, the 10-kilogram autonomous robot can get quick feedback on what lies ahead. (For reference, Curiosity was 900 kilograms.) The autonomous bot also uses LIDAR to navigate, recording its trip with a 4K camera. With an additional 5 kilograms of payload space available for other instruments, the rover is also adaptable for different missions. This, but 20 of them. While the aluminum and carbon-fiber rover may be small, Lunar Outpost intends to remove the stress of attending to a single massive rover by sending a swarm of prospectors instead, or what they call Autonomous Lunar Prospecting Swarms (ALPS). Although early missions may take only a few of the rovers, Gemer imagines a swarm of 20 to 25 rovers. Multiple rovers would cover more ground without having to worry that a single malfunction could stop the entire mission. With the help of the Colorado School of Mines, the Lunar Outpost prospector claims the title of the first commercially tested rover, which they first began testing a couple months ago. Although the testbed mimics the moon as much as possible, from chemical composition of the soil to grain size, lunar gravity or extreme thermal conditions are difficult to take into account. Developing technology for ISRU is a competitive space. With a space treaty set in place to prevent lunar exploitation and ensure fair use, a practical method to reach commercial profitability has proven tricky. In the face of high competition and an ambiguous path to success as a business, Lunar Outpost’s venture as the first entity to do commercial testing marks a significant step forward for space exploration. Stay tuned until 2019, when the team releases more details about their first lunar mission.